All too often, the value of a company’s culture is misunderstood. It can be given lip service, underrated as gimmicky or brushed aside as an afterthought. One common mistake is to perceive it as less significant than the finance, marketing or sales functions. Some leaders think it is enough to offer a few employee perks or tack up posters throughout the office that display their so-called values. I have found that the majority of startup CEOs consider culture to be something they’ll get to when they have the time. Yet what could be more essential than that which permeates every single aspect of a business? Culture, at the end of the day, is what determines the performance across the company and it is significant enough to make or break your business. In today's highly competitive world it's all about the team you build. If nurtured carefully culture is magnetic, repelling the wrong people and enticing the right people to join your company. Company culture development is not easy and like building a strong personal character, it takes investment, awareness, time and requires a test/measure/learn mindset. It is for the most part intangible, subconscious and invisible, and most of the leaders I have met just don’t know how or where to start to define, embed or reinforce their culture. 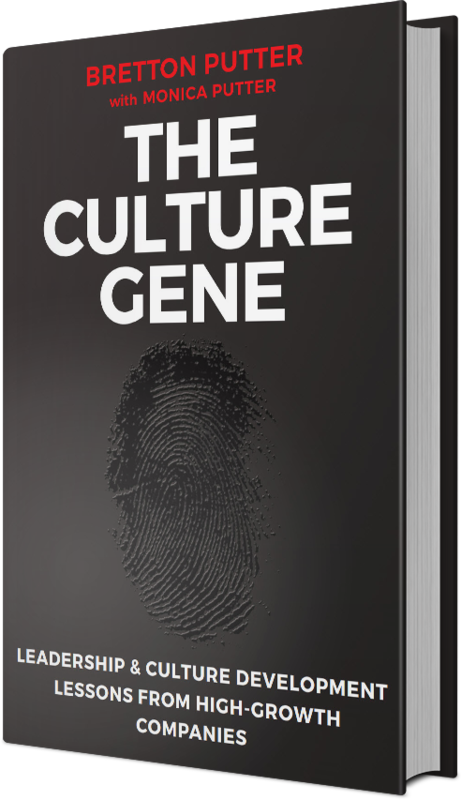 This is why I decided to write Culture Decks Decoded and The Culture Gene. When mastered, company culture is the most powerful lever to drive sustained growth and scalability in your business. If you are fascinated by, or interested in, company culture subscribe to my newsletter. In Culture Decks Decoded, Bretton Putter gathers and analyzes the best culture decks from the world’s most admired organizations — from household names like Netflix, LinkedIn and Nordstrom to cutting-edge companies like Valve, Hotjar and Next Jump. Spotlighting the most impactful culture decks, Brett shows how leaders of culture-driven companies identify and define their own powerful cultures—and craft an engaging, effective culture deck to deliver it, and shape employee behavior. He demonstrates how a well-defined culture differentiates a company from the competition, helps to attract the right A+ talent and becomes an immensely powerful asset for the business. I’ve admired Brett’s take on the importance of culture for years now and have turned to him several times for counsel during turning points in my firm’s growth. 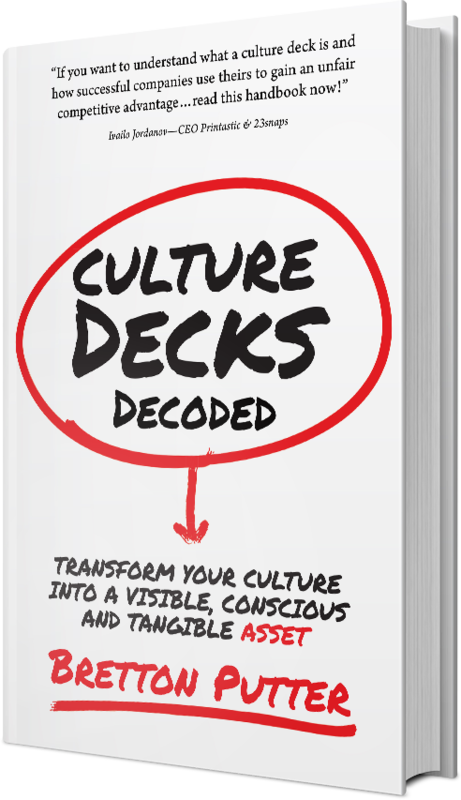 If you want invaluable guidance and insight into how to craft an effective culture deck for your company, this book is for you. This book is brilliant! Brett really simplifies the process of creating a culture deck. The slides he has chosen give a fascinating insight into the culture of these high-performance companies. For his new book, Bretton Putter taps into his experience both as a consultant to companies about their culture and his experience as a top tier head-hunter to outline how companies like Netflix, Hubspot and Hootsuite use their culture decks to describe their cultures and what makes them unique and different. If the Netflix deck is the most important document to come out of Silicon Valley, this must be the most important document to come out of Silicon Roundabout. 9 OUT OF 10 CEOs FAIL TO LEVERAGE THE ONE COMPETITIVE ADVANTAGE THAT THEY HAVE COMPLETE CONTROL OVER. The 10% of CEOs who do maximize their culture automatically gift themselves with a powerful asset and an above-average chance of success. A well-defined culture is the superglue that enables teams to unite, break through the mold, and scale to unparalleled heights. Culture isn’t just a key differentiator for building truly great companies; it is often the primary reason why a candidate joins a particular company—a reason that reigns above the salary, stock options, or the inherent risk associated with the business.